hand side of the "Instituto de Fisica" parking lot. Follow the path untill you reach a building, on the right hand side of the path, which has a library (you see the books through the library windows). 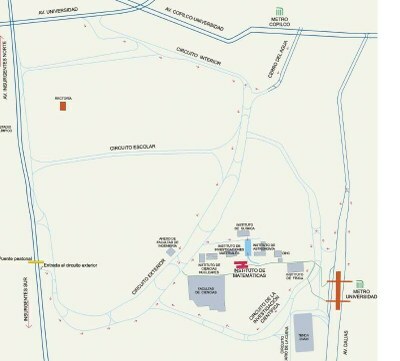 That's the Instituto de Matematicas (marked in red in the map attached). To reach the Institute's entrance you need to go around the building counterclockwise. It should take you about 45 minutes to reach the institute coming from downtown Mexico City.